A good deal of my recent work has been focused on studying deviations to neuronal identity in relation to autism etiology. Though we use the term “neuron” to describe large groups of cells that help to comprise the nervous system, each neuron in fact has a unique molecular identity, prescribed by both internal (autonomous) and external (location in space) factors. It’s the combination of these factors that ultimately determine when a cell will or will not proliferate, whether the two daughter cells will be part of an expanding progenitor pool or whether one or both will instead differentiate and become a different type of cell, when and where that will migrate (if at all), and ultimately how it will behave when it gets to its final resting place. “The culmination of research to date suggests that, though later stages of differentiation are indeed disturbed in autism, encompassing neurite and synapse formation and function, the genesis of these features is generally rooted in even earlier stages of neuronal development and are the result of deviations in cellular identity” (Casanova & Casanova, 2014). When a cell is dependent upon internal and external cues in order to know how to mature properly, when those signals are disturbed even in small ways, the ultimate fate of that cell can be irrevocably altered. For instance, when an embryo has a mutation in the FMR1 gene responsible for coding the Fragile X Mental Retardation Protein (FMRP), neurons with this mutation tend to mature prematurely. This is partly due to the fact that the amount of external growth factors a neural progenitor receives helps to determine when it will differentiate. FMRP normally inhibits differentiation relative to the amount of growth factor a progenitor is receiving, and thus the more FMRP present, the greater the levels of growth factor necessary in order to overcome and differentiate. However, when an embryo houses an FMR1 mutation that reduces or eliminates production of its protein product, lower levels of growth factors are sufficient in order to induce neuronal differentiation; thus, neurons differentiate earlier than typical, leading to a reduction in total number of neurons due to an early depletion of the progenitor pool and likely to some significant disturbances in neuronal maturation. As a metaphor, it’s like sending a prodigal genius kindergartner to high school: he may be ready to do math at a high school level, but he’s going to be far behind his classmates in other ways. A recent study by Mariani et al. (2015) performed an in vitro study that addressed similar issues. 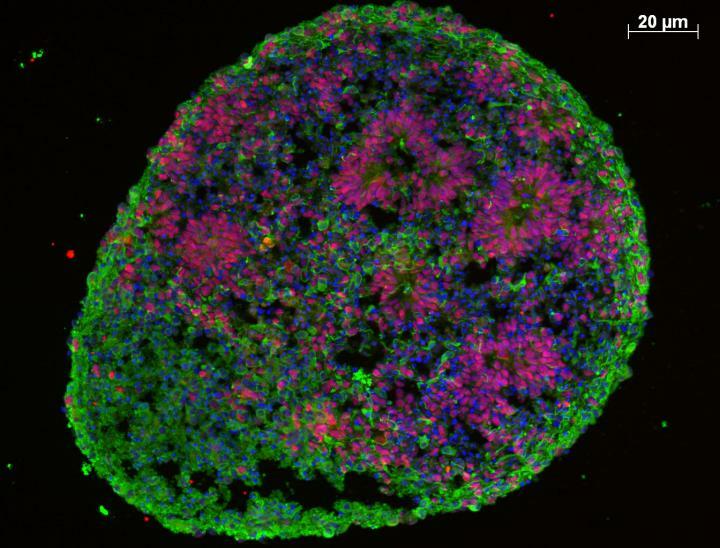 They used induced pluripotent stem cells (iPSC) derived from several autistic individuals with macrocephaly as well as first degree relatives, in order to produce neuronal cell cultures to study cell identity and behavior. They found that cells derived from the macrocephalic autistic individuals tended to mature prematurely, producing increased numbers of GABAergic (inhibitory) neurons, as well as various markers of cytoskeletal and synaptic maturity. They also found that certain proteins were consistently upregulated in the autistic-derived cultures, including upregulation of FOXG1, a protein responsible for a form of Congenital Rett’s Syndrome. Other upregulated proteins also appeared to form a protein interaction network around FOXG1. Due to these results, the team designed an RNA transcript that interfered (RNAi) with the activity of FOXG1, finding that expression levels returned to baseline with the presence of the FOXG1-RNAi. From these results, the team concluded that neuronal differentiation was likely disturbed in those individuals with autism and macrocephaly and that these effects were FOXG1-dependent. This is great if FOXG1 is expressed normally. However, if it’s over- or under-expressed you can imagine the resulting change in numbers of interneurons produced, leading to some potentially hefty effects on the function of the brain and behavior. So, one probable explanation of Mariani’s results, specifically in the abnormal production of GABAergic cells, is due to disturbances in dorsoventral signaling in these cell cultures: not only is differentiation being signaled prematurely leading to early expression of cytoskeletal and synaptic markers, but it ultimately leads to some serious changes in neuronal identity, i.e., expanded ventralization of the progenitor pool.